There are some moments in life when you make that split decision... take the leap of faith or live life with regrets. Luckily for me I was already experiencing a state of euphoria from a LA Times sponsored Gin Tasting at Hotel Juniper when I received the gastronomically outrageous invitation to "30 Ways in 3 Days: Foie Gras Farewell" from my friend Epicuryan. Now. This is that same friend who I believe has somehow decided to make it his goal to kill me with delicious food. I should know better than to say yes... especially to something like this. Thankfully for my taste buds (not so thankfully to my waistline) I ignored reason and woke up to a committal made shortly after Bone Luging with The Minty. So I was in. 30 Courses of Foie prepared by Chef David Féau of The Royce at The Langham Hotel in Pasadena and hosted by Mr. kevinEats himself. It was a ridiculous feat just to finish this feast, but I'm so happy I did. It was the perfect way to (temporarily until the ban is reversed) say farewell to our Foie friends. Check out other reviews below! 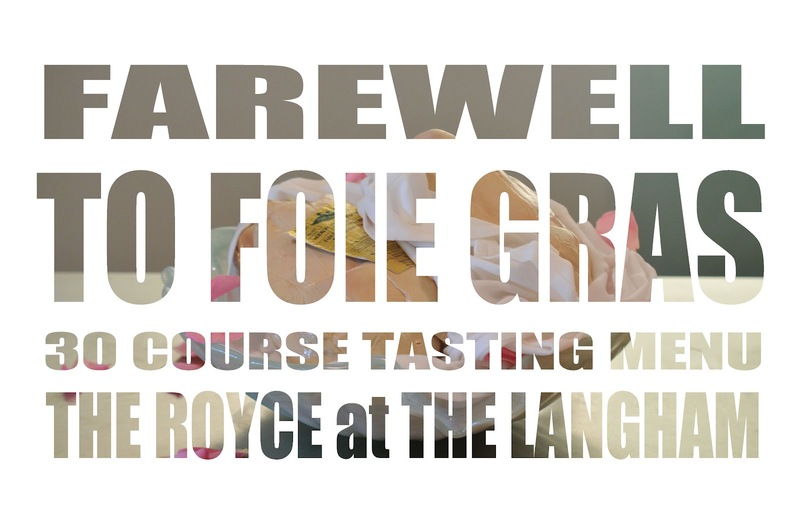 "30 Ways in 3 Days: Foie Gras Farewell"